'Discovery Spas is a "Boutique Australian Manufacturer" of quality baths, spa baths and spa pools. It was started to fill a niche in the market for quality spas at affordable prices that are both simple to use and easy to maintain. 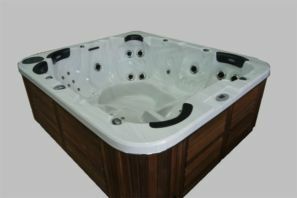 Discovery Spas believe in Innovations surpassing the industries current processes and standards. They are currently working towards being a "Green Manufacturer" who leave minimal footprint on our environment. Discovery Spas was established by Dale Worthington after more than 16 years experience in spa design, manufacturing and consultancy to all major spa and bath manufactures. This knowledge has been utilised to develop a product range that truly understands the benefits of innovative design in hydrotherapy and sports massage. Please check out their website for more info.